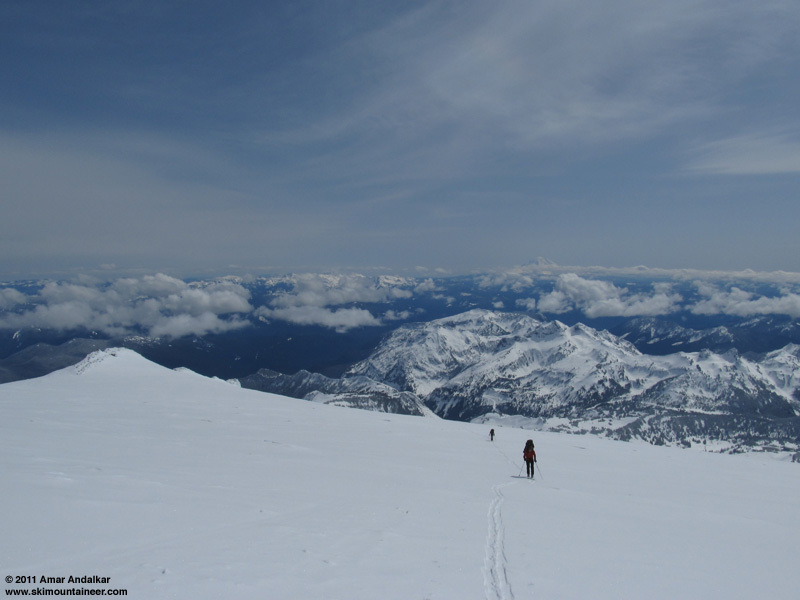 With the forecast predicting Tuesday the 12th as the only partly sunny day within another long stretch of cool and wet weather, it was time to head high again, back to Rainier only 4 days after my previous trip. There was 14" new at Paradise on Monday morning, with another 4" that evening which fell as winds diminished to near calm at Paradise and even at 10000 ft. Could it be a recipe for top-to-bottom powder on the Muir Snowfield? The road was supposed to open at 10am according to the recording, and it actually opened quite a bit earlier (half-hour plus), but I went through the gate right at 10am and still managed to be the third car in the Paradise parking lot. 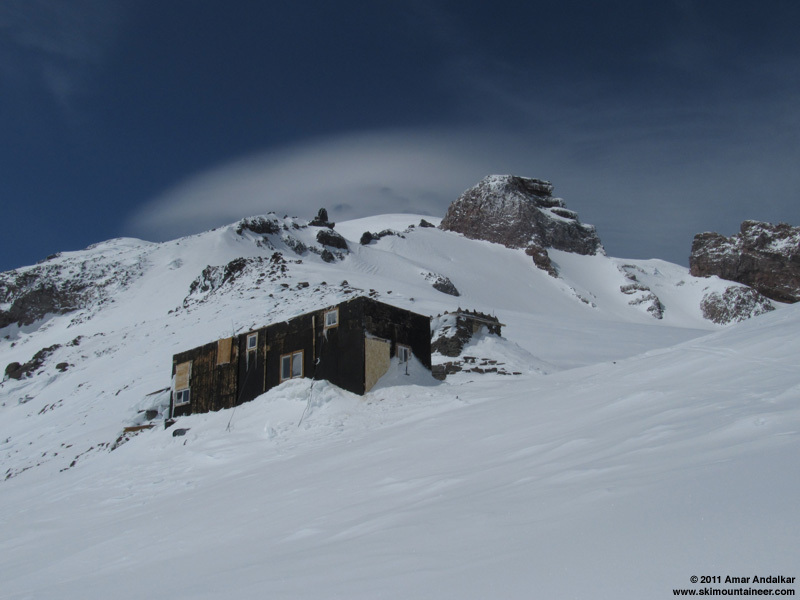 With all the new snow, I figured I'd be breaking a lot of trail, but a quick chat with two RMI guides who arrived just after me revealed that there were two guided parties up above (RMI and IMG), camping at 6200 ft and heading for Muir today for multi-day seminars. With several of the guides on skis, trail should be well-broken for me, they said. Headed up just before 11am under filtered sunshine with a thin veil of high clouds and a slight easterly breeze of a few mph. 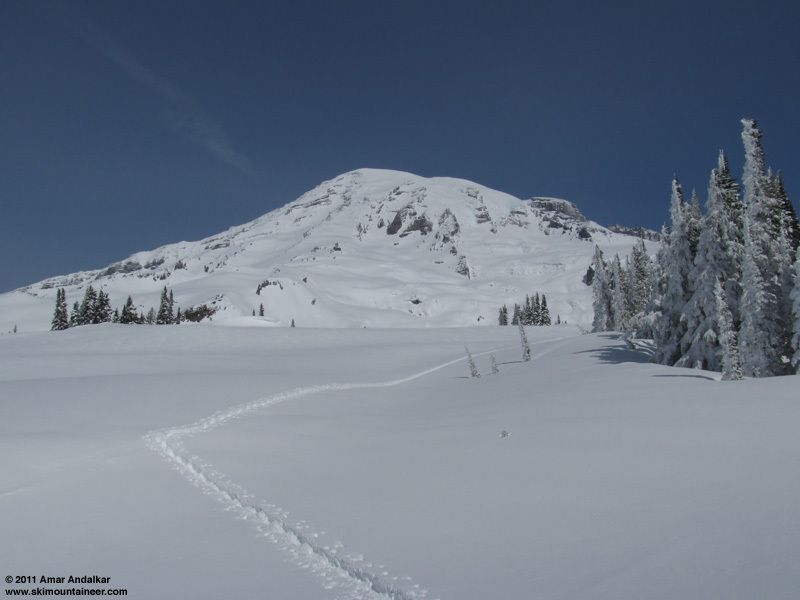 Followed portions of skin/snowshoe track to the now-empty 6200 ft group campsite, then broke my own skintrack in deep powder up the right edge of Pan Face to avoid the steep snowshoe trough up the SW ridge, rejoining the safety of the ridge just above the steep lower part. Followed the guided groups' tracks up above Pan Point, sometimes with nice parallel ski and snowshoe tracks, other times only a single mixed track. Found it easier to put in my own clean skintrack beside their mixed use track, in ideal skinning conditions of several inches of light powder on a firm base. Eventually caught and passed the large RMI of about a dozen near 8000 ft (3 of 4 guides on skis, all clients on snowshoes), and the IMG group of six near 9000 ft (both guides on skis, clients on snowshoes). Then I was out ahead alone, with the privilege of breaking trail through the pristine untracked powder for the whole lot. Generally 2-8" of smooth powder, deposited at the storm's end and barely affected by the wind, sitting atop the firm windcrust from earlier in the storm cycle. Just great. Out ahead and breaking trail for everyone. A stunning day up there which got nicer and nicer, the high clouds thinning to blue sky and glorious warm sunshine, but cool temps in the teens ensuring that the snow remained unaffected. And it was great to feel a lot stronger and faster than my previous trip up here 4 days earlier. 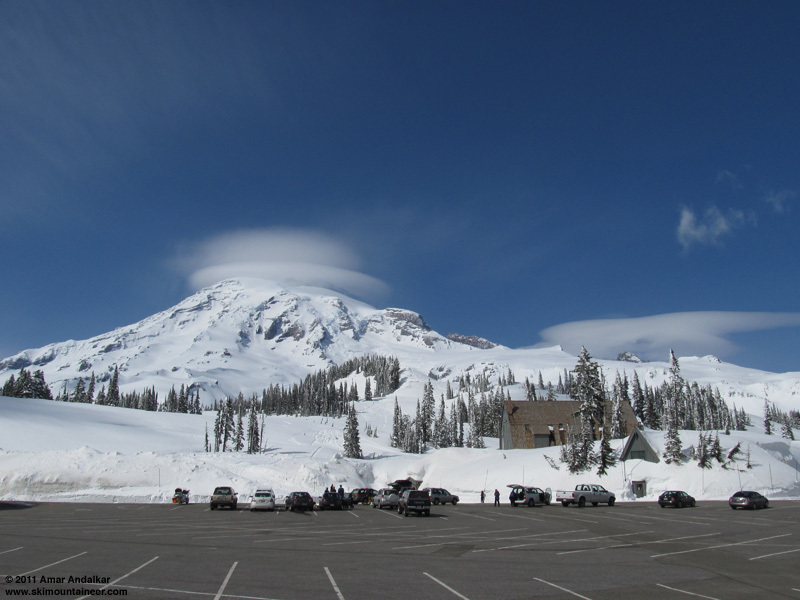 As 2pm passed and I neared Camp Muir, an incipient lenticular cloud began to form atop the summit, just as the high-res UW weather model had predicted: winds at 10000 ft and above would be near-calm early in the day, then increase significantly after 2pm and especially 5pm. 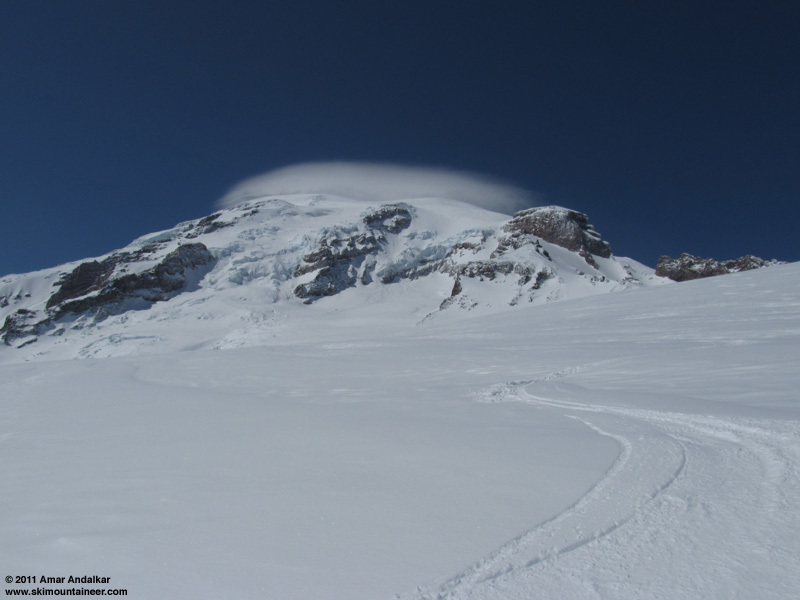 Incipient lenticular cloud growing far above Camp Muir. With the winds increasing and the lenticular growing, there was no need to chill out and linger. I did a leisurely transition, and skied down around 2:30pm. Beautiful ski conditions, smooth fast GS turns in the new powder, barely hitting the smooth crust below in thin sections, floating fast and free in the deeper sections. So nice to enjoy perfect visibility without the dense whiteout of my prior trip, not to mention better snow conditions too. 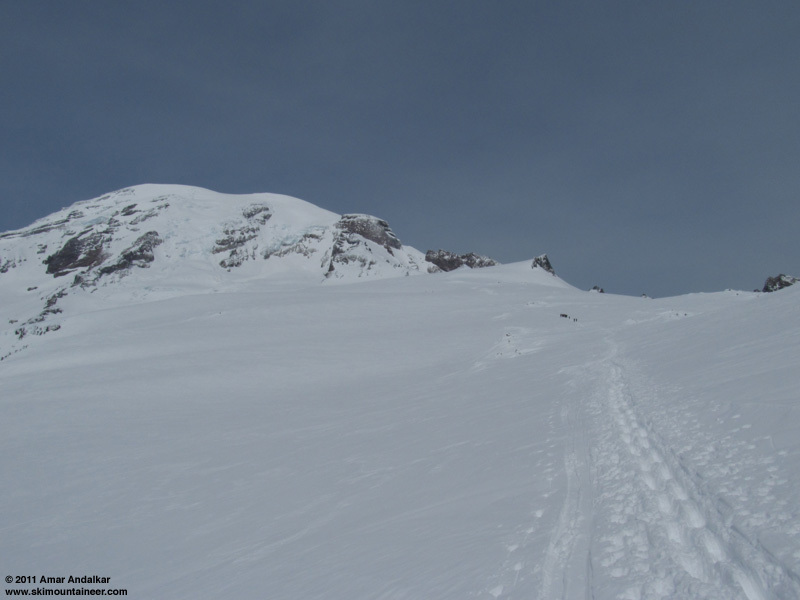 I've only skied better snow in winter conditions on the Muir Snowfield a few times, this was unusually sweet. 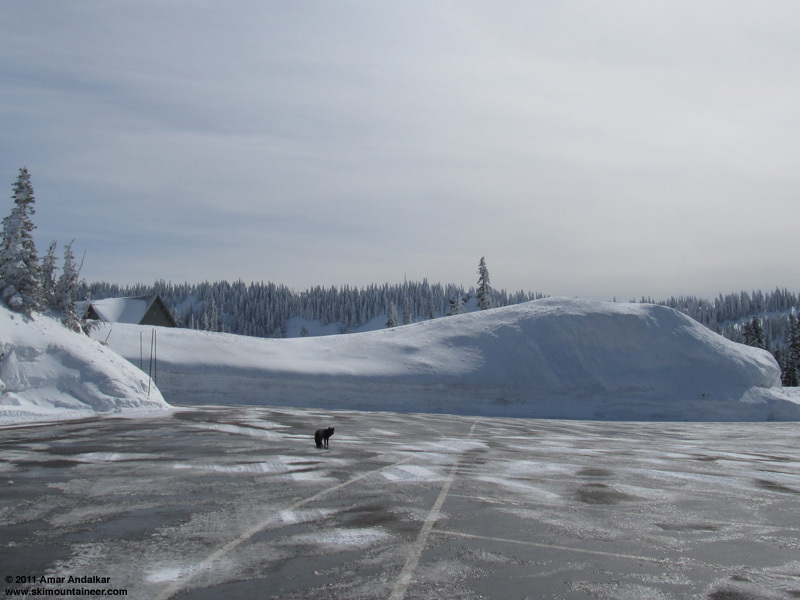 Below 7500 ft, snow conditions were more variable as expected, with thin cover in areas over nubbly rain crust, dense powder in others, but not too bad anywhere. The sun was definitely starting to affect the snow on Pan Face and below, making the powder denser and heavier, but still not concrete or mush. Cool temps and high clouds had helped in that regard. A quick schuss back to the parking lot finished off the descent, interrupted only by numerous stops to look back at the ever changing, ever fascinating lenticulars gracing the Mountain. Another splendid day of sunshine and powder, high up in the Cascades. 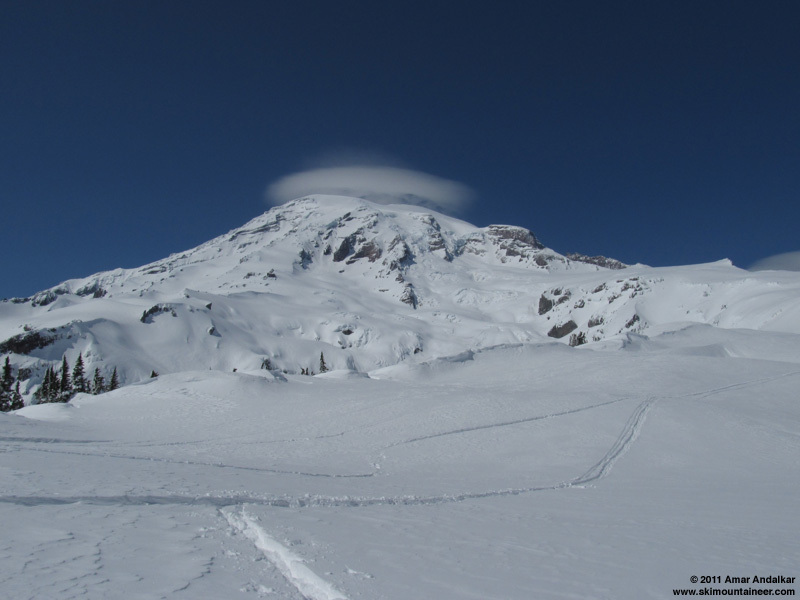 Stacked lenticular clouds atop the summit, with lee wave clouds off to the east beyond Little Tahoma. Deep. 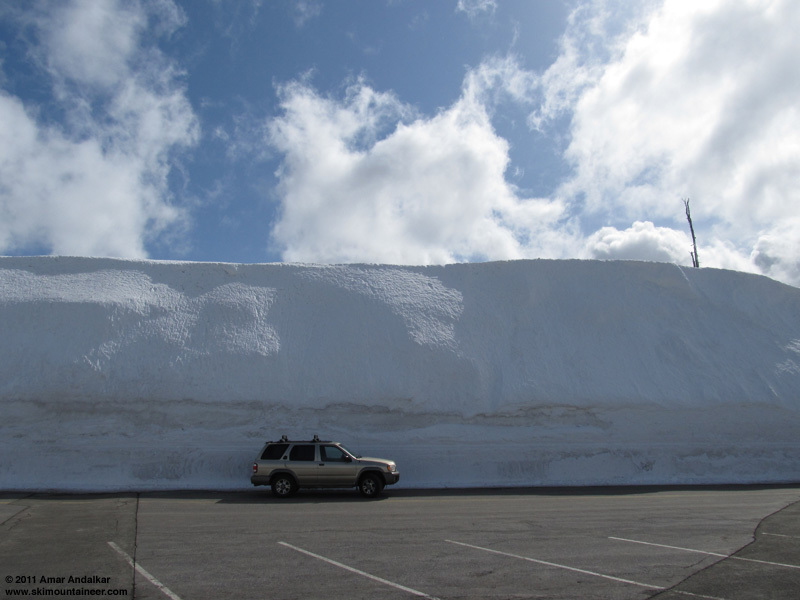 Official snowdepth on this day at Paradise was 236" at the NPS snow stake. SYNOPSIS...A FRONTAL SYSTEM OFFSHORE WILL STALL OVER THE COASTAL WATERS TODAY LEAVING MOST OF THE AREA DRY. THE FRONT WILL PUSH INLAND ON WEDNESDAY. A COOL AND UNSTABLE AIR MASS BEHIND THE FRONT WILL MOVE INTO THE AREA WEDNESDAY EVENING ADDING A CHANCE OF THUNDERSTORMS TO THE FORECAST. ANOTHER SYSTEM WILL MOVE THROUGH THE AREA THURSDAY AND THURSDAY NIGHT. ANOTHER SYSTEM WILL MOVE BY MAINLY TO THE SOUTH OF THE AREA FRIDAY. A COOL UPPER LEVEL TROUGH WILL SETTLE OVER WESTERN WASHINGTON OVER THE WEEKEND KEEPING THE THREAT OF SHOWERS IN THE FORECAST. TUESDAY...PARTLY SUNNY. FREEZING LEVEL 3000 FEET. TUESDAY NIGHT...CLOUDY WITH A CHANCE OF RAIN AND SNOW. SNOW LEVEL 3000 FEET. WEDNESDAY...SNOW AND RAIN. SNOW LEVEL 2500 FEET. WEDNESDAY NIGHT...SHOWERS AND A CHANCE OF THUNDERSTORMS. SNOW LEVEL 2000 FEET. THURSDAY NIGHT...SHOWERS LIKELY. SNOW LEVEL 2000 FEET. FRIDAY...MOSTLY CLOUDY WITH A CHANCE OF SHOWERS LIKELY. SNOW LEVEL 2500 FEET. FRIDAY NIGHT THROUGH MONDAY...MOSTLY CLOUDY WITH A CHANCE OF SHOWERS. SNOW 3000 TO 4000 FEET. Great to see you're out trimming off the extra lbs. Looks like we could have a great spring! Sitting at my desk this morning and reading your report just got me so excited for the weekend. Thanks Amar!! Nice pics Amar! Looked like a great day for Rainier. I'm looking forward to hitting up laps from Paradise to Muir soon to work on conditioning. Good to see you at Snowball!